This is likely to be a pretty long posting on ORDS to describe the workflow for creating a REST application from start to finish. With that said I'm going to have to make a few compromises to keep it tolerable to follow. I thought long and hard about what would be a meaningful example that would be easy to understand but show most of the aspects of building a REST based application using Oracle ORDS. With this in mind I settled on a simple micro service to enable users to "like" products/rows in a similar fashion to being able to like posts on Facebook/Twitter or other social media networks. Whilst there are plenty of examples of how to do this out there already I couldn't find many that explained the entire process from start to finish and using the Oracle Database as the target. 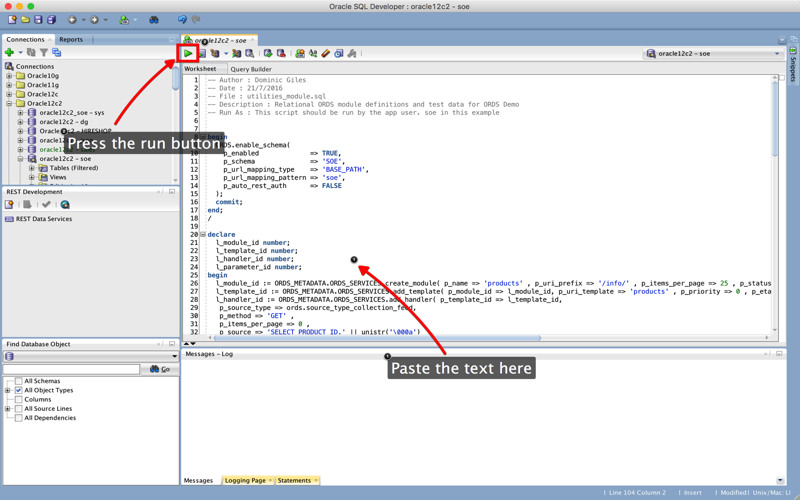 I'll try and keep it up to date as we are expecting to see a few changes in SQLDeveloper and ORDS shortly. On completion we should have a web page that looks a little like the one below. 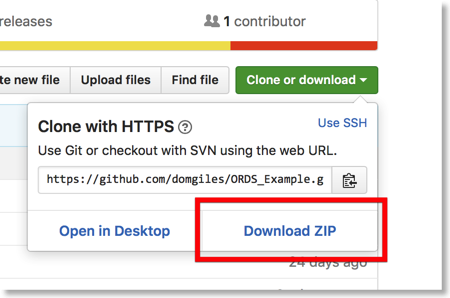 To create a working environment simply go to the link above, click on the "Clone or download" button and then click on the "Download ZIP" link. When it's finished downloading uncompress the file into your preferred location. This post should largely serve as a reference for those wishing to test out this functionality themselves. I'll also be releasing a version of this code where we store JSON in the database as opposed to relational table to offer a comparison with the approach. 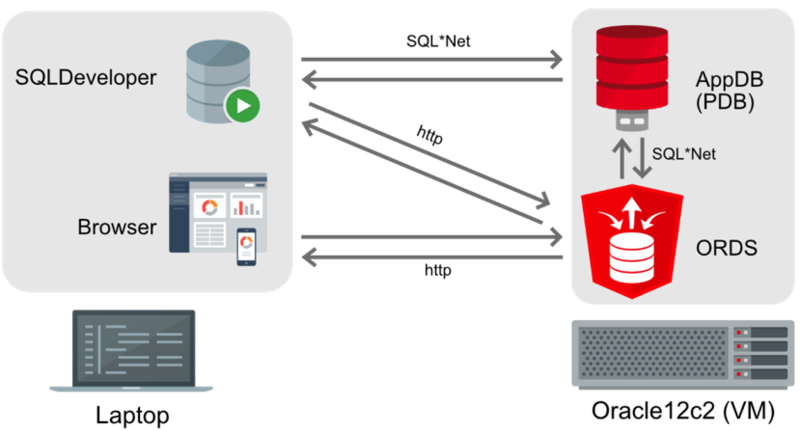 "Oracle REST Data Services (ORDS) makes it easy to develop modern REST interfaces for relational data in the Oracle Database and now, with ORDS 3.0, the Oracle Database 12c JSON Document Store and Oracle NoSQL Database. ORDS is available both as an Oracle Database Cloud Service and on premise. REST has become the dominant interfaces for accessing services on the Internet, including those provided by major vendors such as Google, Facebook, Twitter, and Oracle, and within the enterprise by leading companies throughout the world. REST provides a powerful yet simple alternative to standards such as SOAP with connectivity to virtually every language environment, without having to install client drivers, because it is based on simple HTTP calls which virtually all language environments support. For relational data, ORDS 3.0 now automatically generates REST endpoints for about a dozen major single table operations including create, query, update, and delete. Easy to write JSON filters allow query predicates and sorts to be specified in a query-by-example format. For more complex operations, REST calls are mapped to SQL and PL/SQL routines you can write which return data in JSON and other formats. ORDS 3.0 enables a wide range of operations to be performed on JSON documents in the Oracle Database 12c Document Store using the Simple Oracle Document Access (SODA) API over REST. 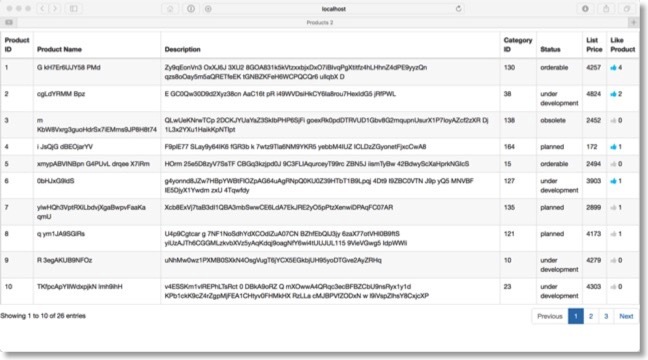 These operations include create, query, update, and delete with support for JSON filters." Alternatively you could download a Virtual Box VM such as the "Hands-on Database Application Development" VM from here.Which will provide everything you need in a ready configured package. I'm also going to assume that you'll be running on a unix type OS (Linux, Mac OS, Solaris, AIX). Although this will also work fine on windows (just need to convert some of the commands). For my setup I have the following configuration. Assuming you aren't going down the pre installed Virtual Box VM mentioned in the previous section. The install of ORDS is very simple. After you've downloaded it to your VM/Server/Laptop all you need to do is unzip it and change into the directory . i.e. In the directory you unzipped the download run ORDS. The first time you run this it will lead you through the install asking you for the connection to the database. 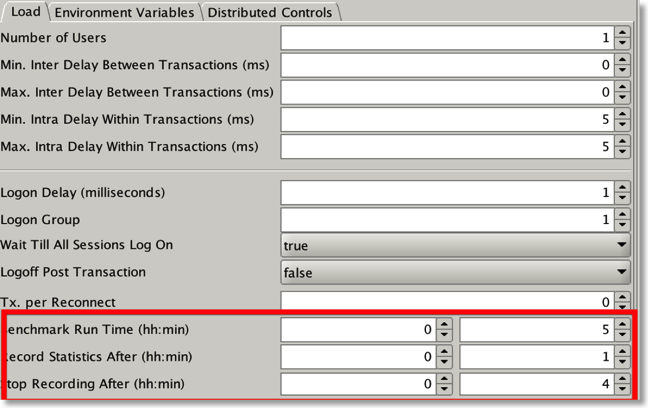 I'd recommended skipping configuring APEX at this stage (by selecting 2 when asked) and running ORDS using http. Whilst these options might not be ideal for production environments they will enable you to get started. After this completes hit control-c to exit the program. 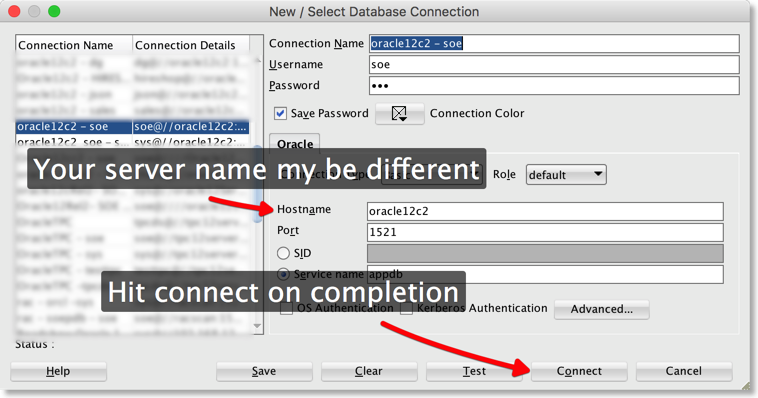 At this stage you should probably add a user with SQLDeveloper development support. I've named mine "appdev" but any name would be fine. We'll use this user later in the example. You can do this using the following command and supplying passwords. Thats all thats needed to install ORDS. 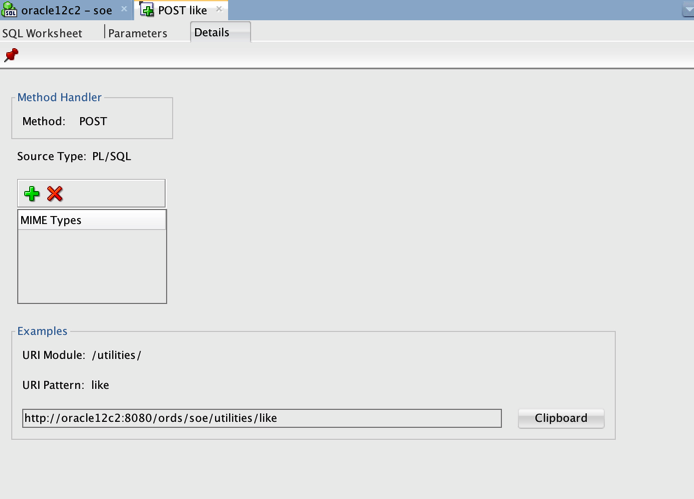 At this stage it's worth starting SQLDeveloper where the bulk of the work will be done. You'll need to create a connection to the Database .You'll do this from the connections tab as show below. 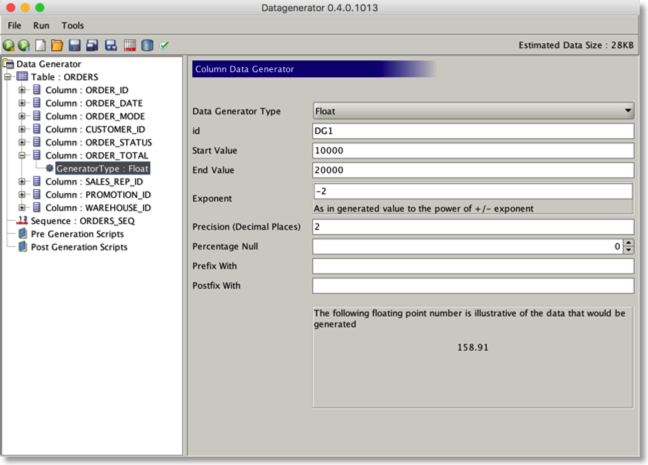 The next step is to create the example tables and test data. 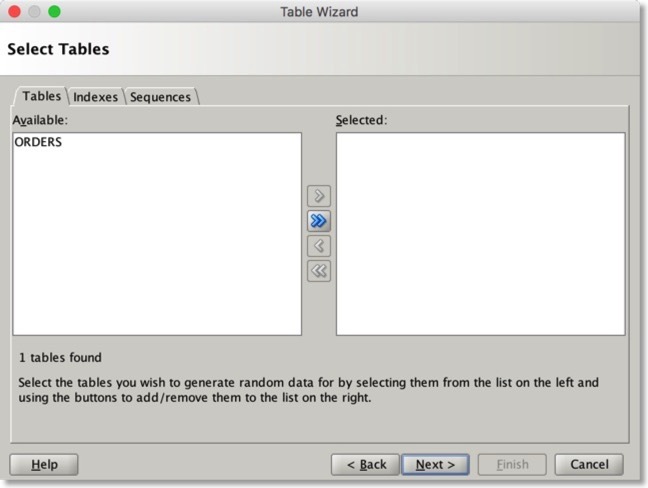 I've provided a simple script "create_tables.sql to do this for you. It will create one to hold the "product_information" that would be typically part of and existing application and other to hold the likes. 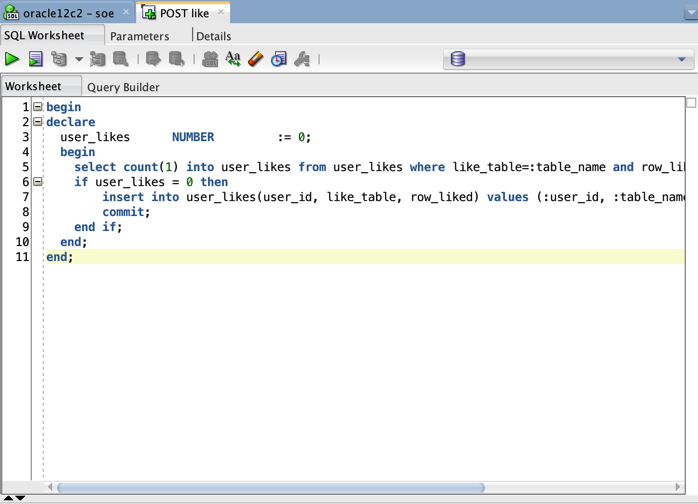 This table is called "user_likes". 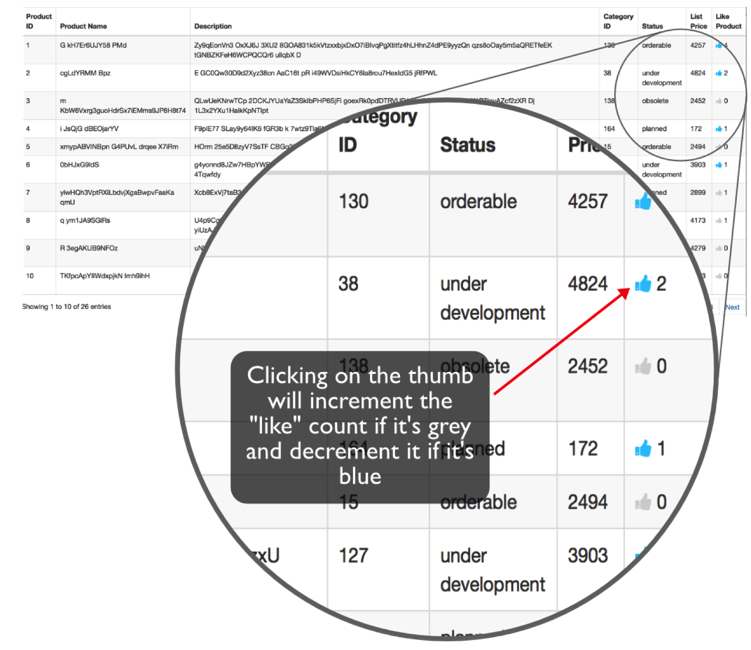 The "USER_LIKES" table is an Index Organised Table. Whilst the trivial amount of data we holding in this example won't benefit from his approach it would likely have an impact on production scale workloads. The script will insert a few sample rows as well. This will launch the REST development UI (by default on the left hand side of the screen) as shown below. Add a new connection and fill in the details as shown i.e. Server Path = "/ords" and Schema Workspace = "/soe/". The next step is to run a script "utilities_module.sql" which will enable the schema to support ORDS and create the ORDS modules used by the application. This is purely for convenience. I'll describe the process of creating one of the modules in a blog shortly after this one. 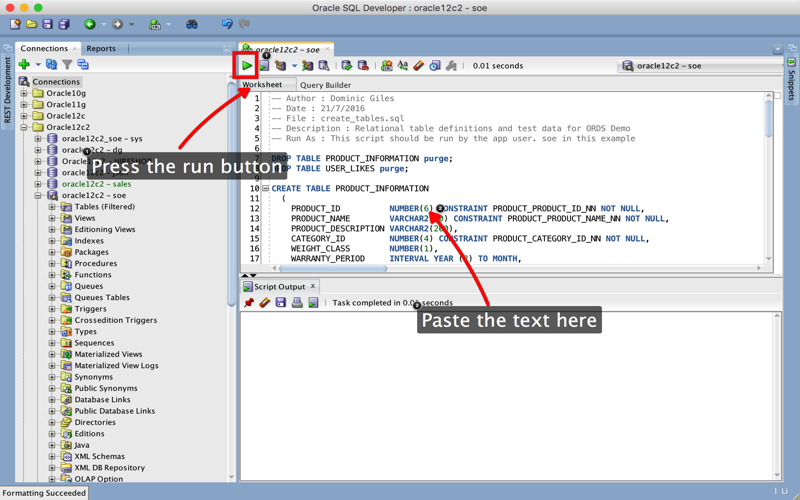 To install the REST modules simply copy and paste the code below into the SQLDeveloper session you've already created. Products : This will simply retrieve the rows from the PRODUCTS table. It's not really necessary to explicitly declare this module as ORDS base functionality already has a REST API that could be used instead. 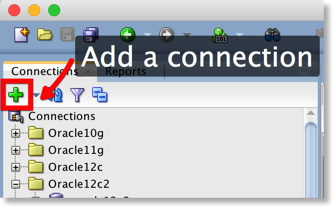 You can drill into the details of each service by clicking on it and then clicking on the HTTP operation it uses in SQLDeveloper. The details of the service comprises of three sections (here we'll take a look at the "like" service). The first tab list the SQL or PL/SQL that will implement the business logic. In this particular example we are using PL/SQL to first check if a user has liked a row by checking first the USER_LIKES table. If they haven't already liked the row we insert a new one and commit the transaction. 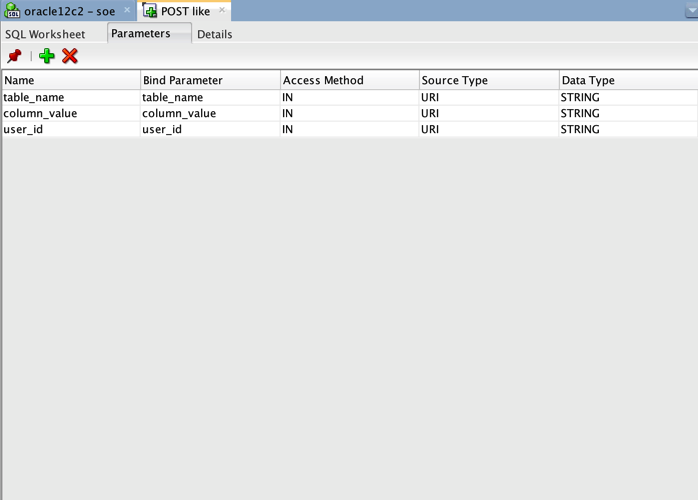 The next tab lists the parameters that are passed to our logic or SQL statement. In our particular example we are passing three parameters that tell the procedure the table that is being liked, the unique identifier for the row (in our simple case it's assumed to be a string but could as equally be a rowid or number) and the user identifier (typically application specific but we'll assume it's something like an email). The final tab summarises some of the settings for the service and provides you with a url to call to test the service. Obviously substitute the name of your server in the code. You should get a HTTP return code of 200. Indicating that the code successfully ran. You should get a small JSON snippet with the number of likes by everybody and the user "dominic.giles"
Now that we've got the services up and running we can use a simple web page that displays all of the rows from the PRODUCT_INFORMATION table with a "thumb" to enable us to like the row. Like all of the code used in this blog you can find them all on my github repository.Let me start by saying that the web page we are going to create is a very simple example and would normally require a lot more validation and error handling before it would ever be considered for a production environment. This really isn't the place to go into all of the details of the code but there are one or two things that are worth pointing out. The first is at the start of liketable.js file. You'll need to change the following entries to reflect your own environment. It's likely you'll only need to change the "hostport" variable to start with. The username is hardcoded in this example but in the real world it would be derived from the system context. Likewise the following shows the AJAX call to the like function. This call unlike the the previous one is performed synchronously but follows the same principals. Once you've made the changes to the hostname variable you should be able to open a browser and open the products.html file within it. Over the coming days I'll knock up a little screen cast to accompany this blog.